Gurbantunggut Desert is China’s second largest desert. The annual precipitation is 70-150 mm, and there is snow in winter. The precipitation is slightly more in spring and early summer, and the distribution is more even in the middle of the year. Most of the desert interior is fixed and semi-fixed sand dunes, accounting for 97% of the total desert area, forming the largest fixed and semi-fixed desert in China. Vegetation coverage on fixed sand dunes is 40-50%, and semi-fixed sand dunes are 15-25%, which is an excellent winter pasture. There are more than 100 species of plants in the desert. The flora component is in the transition from Central Asia to the deserts of central Asia. The most representative type of dune in the desert is sand shoal, which accounts for more than 50% of the desert area. The plane shape of the sand raft is dendritic. Its length ranges from a few hundred meters to more than ten kilometers, and its height ranges from 10 to 50 meters. It is high in the south and low in the north. In the Taklimakan Desert, the Uyghur language means “the place where you come in but can’t get out.” People often call it the “the sea of death.” Located in the center of the Tarim Basin in southern Xinjiang, it covers an area of 324,000 square kilometers and is the largest desert in China and the second largest mobile desert in the world. Among the world’s major deserts, the Taklimakan Desert is the most mysterious and tempting one. 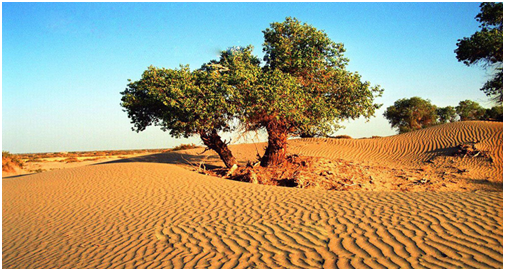 The center of the desert is a typical continental climate with strong wind and sand, large temperature changes and less precipitation throughout the year. There are frequent wind and sand activities here, and the sand dunes are unusual in shape, up to 250 meters. The most amazing thing is that the tops of the red and white sand dunes have formed a “big mushroom” through wind erosion. Animals such as hares and birds live in the forest belt, adding a little life to the “sea of death.” The investigation also found that the groundwater in the desert is rich and is conducive to development. It has lives as long as existence water, and scientific investigations overthrow the “life forbidden zone theory.” In the vast desert, there are countless ancient city sites discovered so far, and the Niya site has unearthed printed cotton and embroidery in the Eastern Han Dynasty. The Kubuqi Desert is 400 kilometers long and 50 kilometers wide. The sand dunes are 10 to 60 meters high. It is the sixth largest desert in China and the desert closest to Beijing. The climate of the Kubuqi Desert belongs to the arid and semi-arid areas of the mid-temperate zone. The temperature is high, the temperature difference between day and night is large, and the climate is dry. The annual windy days are 25 to 35 days. The east is relatively more rainy and the west lacks water.